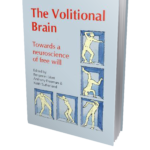 The Volitional Brain: Towards a Neuroscience of Free Will - Jon Lieff, M.D. Benjamin Libet contributed to the notion that there is no free will by finding that 200 milliseconds before we act the unconscious brain displays a signal of the future action. He is the editor of this volume of essays where he tries to set the record straight about his view that although the unconscious may start the process, there is still a conscious veto power that does leave open the notion of free will.